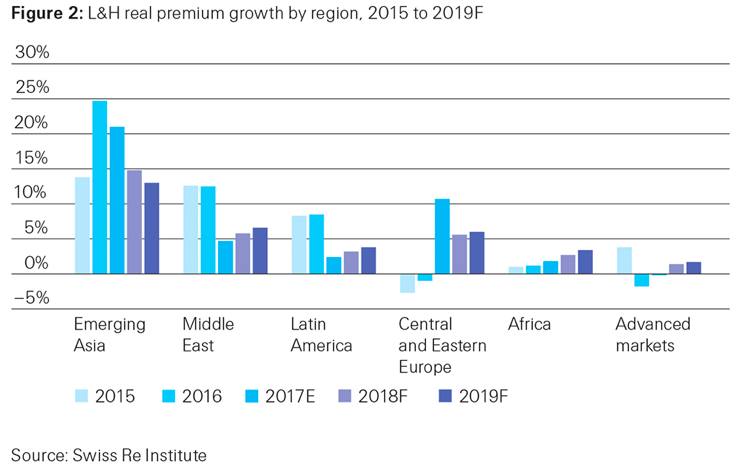 The cyclical upswing in the global economy is set to continue in 2018 and 2019, supporting insurance premium volume growth. 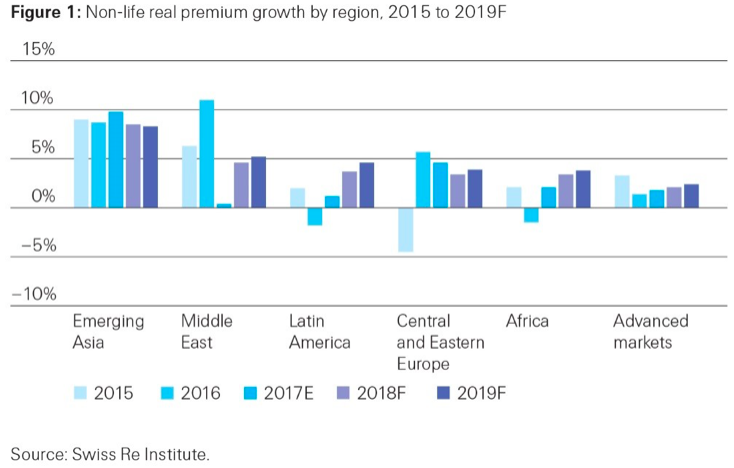 Global non-life premiums are forecast to grow by at least 3 percent annually in real terms in the next two years and life premiums by 4 percent. Emerging markets, particularly in Asia, will remain the driver of global non-life and life premium growth, according to Swiss Re. Our earlier post Working with nature to build resilience to hurricanes discussed how insurers look to natural infrastructure like coastal wetlands and mangrove swamps to mitigate storm losses. The Mesoamerican Reef, which runs south for some 700 miles from the tip of the Yucatán Peninsula protects coastal communities and property by reducing the force of storms, but its corals require continued repairs. For every meter of height the reef loses, the potential economic damage from a major hurricane triples, according to The Nature Conservancy (TNC). Now thanks to TNC and Swiss Re, the reef is about to get its own insurance policy. Tens of thousands of policyholders caught in a disaster in 2016 were better able to recover from the losses and hardships inflicted thanks to insurance. Global insured losses from catastrophes totaled around $54 billion in 2016 – the highest level since 2012, according to the latest report from Swiss Re sigma. North America accounted for more than half the global insured losses in 2016, with insured losses from disaster events reaching $30 billion, the highest of all regions. This was due to a record number of severe convective storms in the United States and because the level of insurance penetration for such storm risks in the U.S. is high, sigma noted. For example, a hailstorm that struck Texas in April 2016 resulted in an economic loss of $3.5 billion, of which $3 billion, or 86 percent, was covered by insurance. For example, Swiss Re noted that the U.S. has been and continues to be critically underinsured for flood risk, with a flood protection gap of around $10 billion annually. Additional Insurance Information Institute facts and statistics on global catastrophe losses are available here. Total global insured losses from natural catastrophes and man-made disasters in 2016 rose to at least $49 billion in 2016, 32 percent higher than the $37 billion recorded in 2015. Preliminary estimates from Swiss Re sigma put insured losses from natural catastrophe events at $42 billion in 2016, up from $28 billion in 2015, but slightly below the annual average of the previous 10 years ($46 billion). Man-made disasters triggered an additional $7 billion in insurance claims in 2016, down from $9 billion the previous year. Hurricane Matthew and severe storms in the United States generated high losses during the year, Swiss Re noted. Insured losses from Hurricane Matthew, which caused devastation across the east Caribbean and southeastern U.S. in October, are estimated to be in excess of $4 billion, while economic losses were $8 billion. Matthew was also the deadliest natural catastrophe of the year globally, claiming up to 733 lives, most of those in Haiti. A number of severe weather events impacted the U.S. in 2016, including a series of severe hail and thunderstorms. The costliest was a hailstorm that struck Texas in April, resulting in economic losses of $3.5 billion and insured losses of $3 billion due to heavy damage to property from large hailstones, Swiss Re said. Total economic losses from natural catastrophes and man-made disasters globally are estimated at $158 billion in 2016, significantly higher than the $94 billion recorded in 2015, due to some large natural catastrophes such as earthquakes and floods. The gap between total losses and insured losses in 2016 shows that many events took place in areas where insurance coverage was low, Swiss Re said. Earthquake losses, in particular, underscore the underinsurance problem. For example, government sources put the overall reconstruction cost of an earthquake in August in Italy as high as $5 billion. But insured losses for that event are only a fraction of the total, estimated at $70 million, mainly from commercial assets. The Kumamoto quakes that struck Japan in April were the costliest disaster event of the year, causing at least $20 billion in economic losses, and $5 billion in insured losses. While total economic losses from natural catastrophes and man-made disaster events remain far below-average in the first half of 2015, the global insurance and reinsurance industry is covering a higher than average percentage of those losses. That’s the key takeaway from preliminary sigma estimates of global catastrophe losses for the first half of 2015, just released by Swiss Re. Of the $37 billion in total economic losses from disaster events in the first half of 2015, the global insurance and reinsurance industry covered nearly 45 percent, or $16.5 billion, of these losses. This is higher than the previous 10-year average of 27 percent covered by the global re/insurance industry. 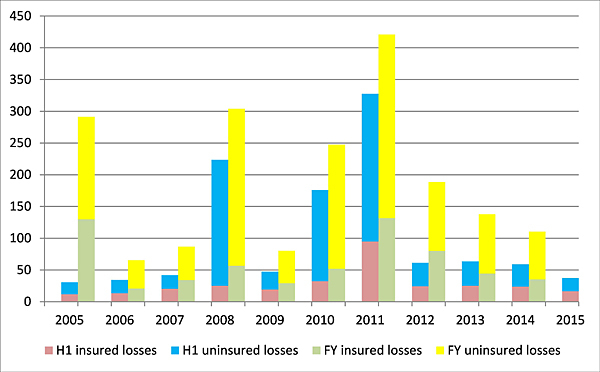 Of the overall insured losses in the first half of 2015, $12.9 billion came from natural disasters, down from nearly $20 billion in first half 2014, and again below the average first-half year loss of the previous 10 years ($25 billion). Man-made disasters triggered an additional $3.6 billion in insured losses in the first half of 2015, sigma said. 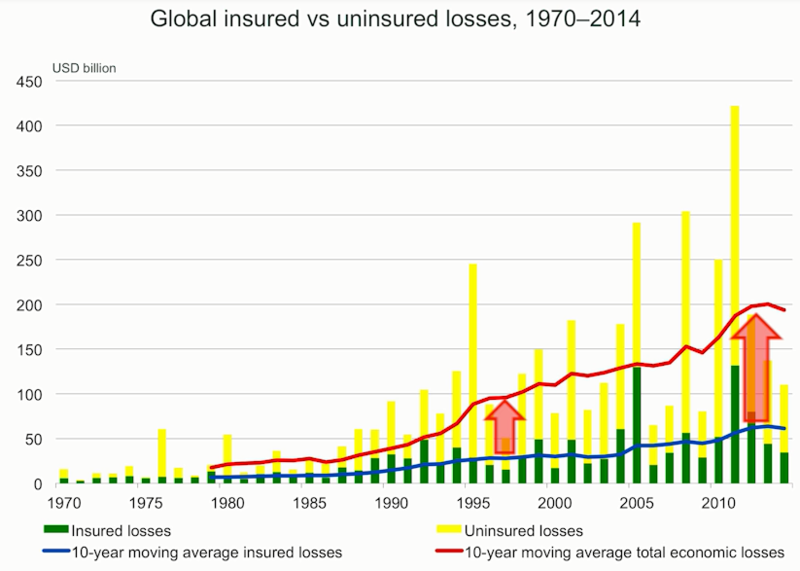 So why did insurance and reinsurance cover a higher proportion of global catastrophe losses in the first half? The answer lies in the location of the most costly insured natural catastrophes losses for the insurance industry in the first half of 2015–thunderstorms in the United States and winter storm losses in Europe. These larger loss events, as well as the severe winter weather in North America, all contributed to the lower percentage of uninsured losses through the first half of the year. 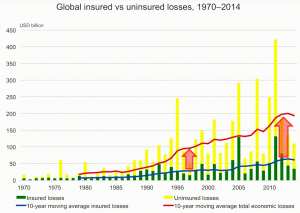 But, as Artemis blog reports here, sadly the lower proportion of uninsured losses is not related to any major increase in insurance penetration. The Nepal earthquakes provide a striking example. While economic losses from the quakes are estimated at $5 billion, only around $160 million were insured. Check out Insurance Information Institute (I.I.I.) facts and statistics on global catastrophes. The amount of financial loss caused by catastrophes not covered by insurance is growing, according to the latest Swiss Re sigma report. 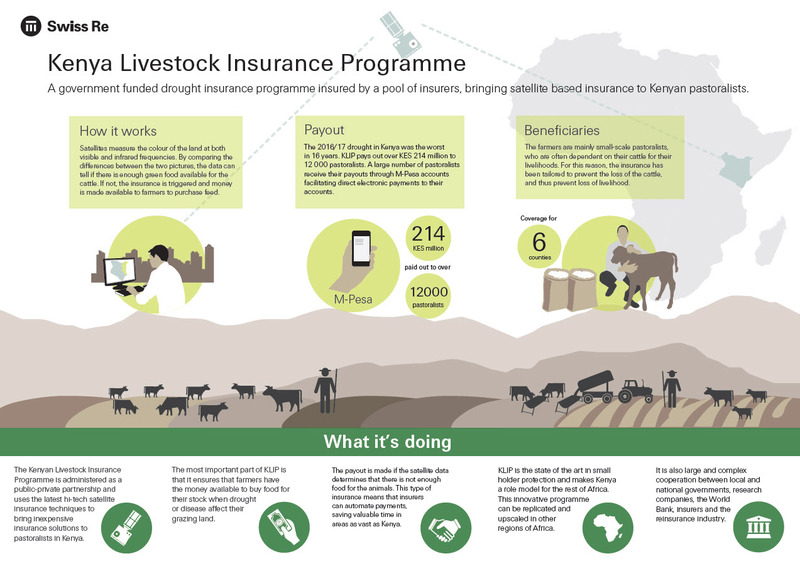 This so-called global insurance protection or funding gap totaled $75 billion in 2014. Lack of insurance cover clearly remains an issue in many countries. Swiss Re gives the example of low pressure system Yvette last May which brought very heavy rain in Europe to Serbia, Bosnia and Croatia — in some areas the heaviest downpour in 120 years. Yvette resulted in 82 fatalities, the largest loss of life from a natural catastrophe in Europe in 2014, and total losses were estimated to be $3 billion — mostly uninsured. Areas of the United States are also underinsured, sigma reports. Last August’s South Napa earthquake caused structural and inventory damage of $0.7 billion, particularly in the numerous local wine barrel storage facilities. However, the insured loss was just $0.16 billion. Meanwhile, the economic cost of natural disasters continues to rise due to economic development, population growth, a higher concentration of assets in exposed areas and a changing climate. Without a commensurate increase in insurance penetration, the above will likely result in a widening protection gap over the long term, sigma concludes. I.I.I. has more facts and statistics on global catastrophes available here.